"Everybody was in a state of panic. It was just chaos." Kino Lorber has released a trailer for a documentary titled Tower, retelling the story of the Texas Tower Sniper who killed 16 people and wounded 32 others in 1966. Described as a "hybrid of animation, interviews, and recreations", the film features rotoscoped footage (think Waking Life or A Scanner Darkly) that recreates some of the moments during the shooting. There's also interviews and other footage that has been rotoscoped, making this a bit more unique and different than just another documentary about a tragic event (shooting) in American history. This seems like it might be interesting to see, since we all know the story but there's a completely different feel to this. Take a look. August 1, 1966, was the day our innocence was shattered. A sniper rode the elevator to the top floor of the iconic University of Texas Tower and opened fire, holding the campus hostage for 96 minutes in what was an unimaginable event. Tower combines archival footage with rotoscopic animation of the dramatic day, based entirely on first person testimonies from witnesses, heroes and survivors, in a seamless and suspenseful retelling of the unfolding tragedy. The film highlights the fear, confusion, and visceral realities that changed the lives of those present, and the rest of us, forever - a day when the worst in one man brought out the best in so many others. 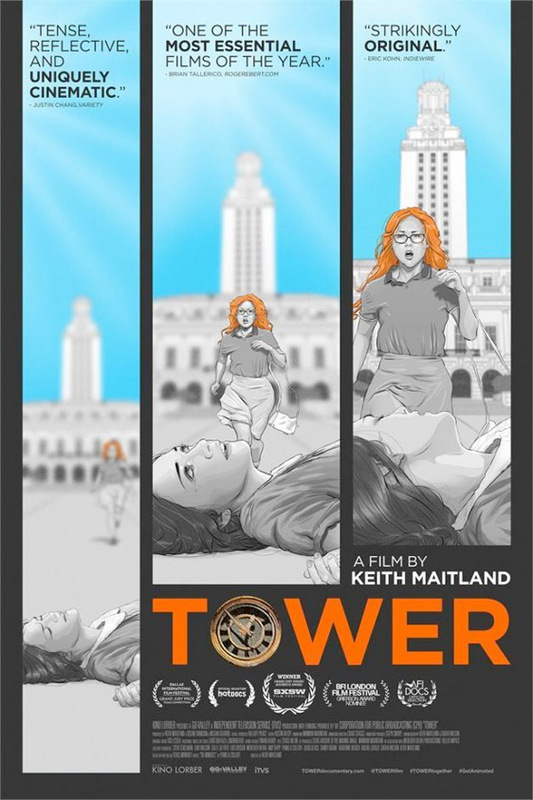 Tower is directed by Keith Maitland, of The Eyes of Me doc. This first premiered at SXSW. Kino Lorber opens Tower in limited theaters starting October 12th next month. Considering how many shootings happen in America, yes... Yes it was. "Considering my political leanings... Yes. Yes it was." Is what you meant to type. Don't worry. I gotchu. It was a shooting no matter what, and my politics have nothing to do with it. It sounds like your politics are making you upset about it when really it's just an objective word included in the article. How is that political? Is there a pro-mass-shooting political stance in America? Wouldn't really surprise me if there was these days. It wasn't a shouting anyhow. I kind of get why they rotoscoped it, but I think it would be a lot more impactful if they chose not to do this. There's both pros and cons to how it seems they've made this. I can't wait for my chance to watch it. Was this done with animation in order to seemlessly combine archival footage with modern re-enactments? Looks interesting.